Mensusa https://www.mensusa.com/articles/select-the-matching-shirt-and-tie-set-for-a-perfect-look.html Select The Matching Shirt And Tie Set For A Perfect Look Most men take care of their attire along with their footwear nowadays. Hence whenever they step out of their homes, they wear matching accessories like the shirt and tie set to look perfect. Those who wish to put on a dazzling look, opt for the men's golden dress shirt for it is a unique shirt that draws attention of all around easily. You may have many shirts and many ties in your wardrobe but do not know how to pair them appropriately. For such men, the shirt and tie set available at MensUSA helps a lot to get the handsome look that all men desire. When you dress up, you need to take into account every part of your attire including the tie and shoes. So the best and the safest option to stay ready always is to store the best combinations of shirt and tie set in your wardrobe. This makes it easier for you to get ready appropriately and not waste time matching the accessories with the dress shirt and the suit. 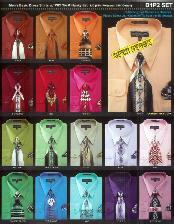 When you can avail of the trendiest sets of shirt and tie set at MensUSA, then why waste time? Gold color is a mark of affluence and liveliness. When you wish to stand out from the crowd and look dashing and different from others, wear the men's golden dress shirt. You can utilize this bright color to dress up as well as down according to the occasion. If you pair your men's golden dress shirt with denims or a designer jacket, you can achieve a sophistical and classic look. When you wish to wear a gorgeous look, team up the golden dress shirt with dark shades of jackets or suits like black, or other bold colors to establish a new and outstanding look in a crowd. Your attire is like a mirror of your personality. What you wear and how you carry them expresses your sense of style and standard of choice. 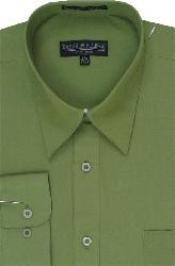 If you love the mint color, select the perfect fitted mint dress shirt from MensUSA, that has a marvelous collection of various shades of mint dress shirt. 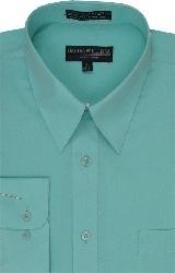 It is a color that matches with all shades and so you can make the maximum use of your mint dress shirt. It gives you a sophisticated look when you team it up with sober accessories. On the other hand, the same mint dress shirt will give you an astounding appearance when paired with bright shades of suits or trousers. Wearing the same old solid color shirts or the stripes makes you feel tired. You feel bored when trying to match the other accessories with them. 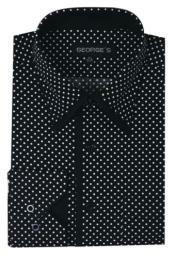 Have you tried out the polka dot shirt men? It is a great option when you wish to look smart and funky. It gives you a new look especially when you get the accurate fit and matching accessories. You can match various shades of suits or trousers and jackets with the polka dot shirt men for often the shirt has various shades of polka dots in it. Purple is a royal shade and when a purple dress shirt is teamed up with the appropriate suit or jacket, it just makes you look outstanding. 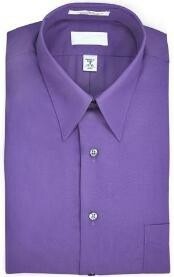 At parties and weddings, a purple dress shirt creates magic for the wearer. It makes you the hero of the show.